Puducherry, formerly known as Pondicherry literally New Town in Tamil is a Union Territory of India. It was formed out of four exclaves of former French India namely Puducherry, Karaikal, Yanam and Mahe. It is named after the largest district Puducherry. Historically known as Pondicherry, the territory changed its official name to Puducherry (Putuccēri) on 20 September 2006. Puducherry, formerly known as Pondicherry literally New Town in Tamil is a Union Territory of India. It was formed out of four exclaves of former French India namely Puducherry, Karaikal, Yanam and Mahe. It is named after the largest district Puducherry. Historically known as Pondicherry (the territory changed its official name to Puducherry (Putuccēri) on 20 September 2006. 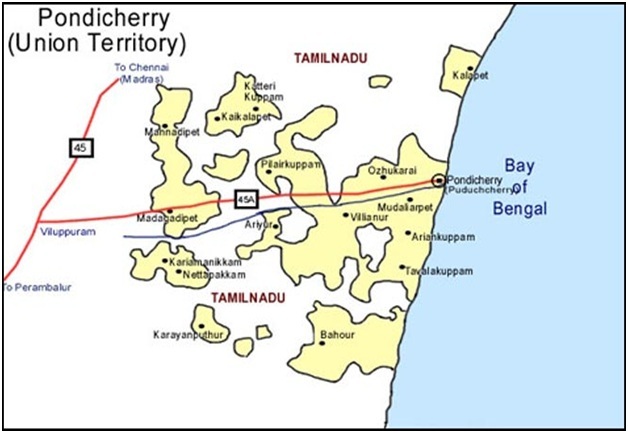 The territory of (Puducherry) comprises the former French establishment Puducherry, Karaikal, Mahe and Yanam, which lie scattered in South India. Puducherry, the capital of the territory was once the original headquarters of the French in India. It was under the French rule for 138 years and merged with the Indian Union on 1st November 1954. It is bounded on the east by the Bay of Bengal and on the three sides by Tamil Nadu. About 150 kms south of Puducherry on the East Coast lays Karaikal. It can be reached from Calicut Airport, which is 70 km from Mahe. Yanam is situated adjoining the East Godavari district of Andhra Pradesh and is about 200 kms from Visakhapatnam airport. Agriculture Products: Rice, Pulses, Coconuts, Arecanut, Condiments Groundnut, Chilies etc.